*Which character are you? * Harry Potterscopes ;)). . Wallpaper and background images in the 哈利·波特 club tagged: harry potter cast. hey! i'm HARRY!! oo ohh! 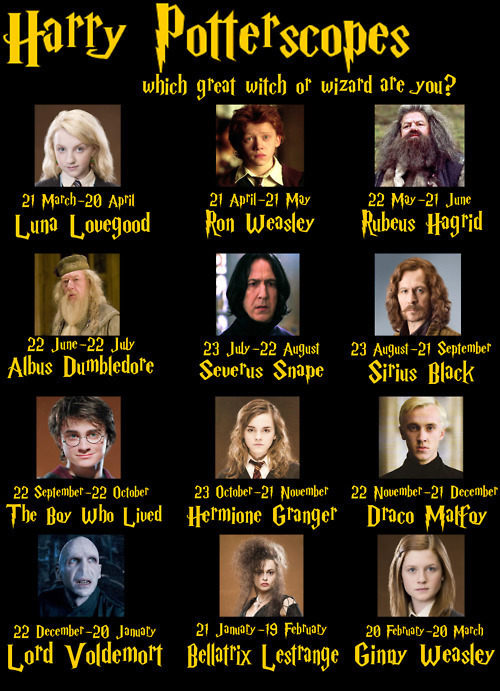 Yeah, I'm in the Severus month !!! Great !!! Hagrid. I want SIRIUS !! boy ! i am malfoy !!!!!!!!! Harry .... But I wanted Bellatrix . Well , I like Harry too . Shouldn't these be based on the characters' own birthdays, at least when theirs are known? Harry, Ron, Ginny and Hermione are all in the wrong months. Sirius' birthday is known to be in September or October because JKR has revealed he was already 22 when he was imprisoned.